Shanghai Sparrow is a Far Eastern steampunk tale of espionage, distant empires and thrilling exploits, with a dynamic heroine. Eveline Duchen was once a country child, living a life of privilege, touched by the magic that still clings to the woods and fields of Victorian England. Now she is a street urchin in a London where brutal poverty and glittering new inventions exist side by side, living as a thief and con-artist under the wing of the formidable Ma Pether. Caught in an act of deception, Eveline is faced with Mr Holmforth, a gentleman in the service of Her Majesty’s Government, who offers her a stark choice. Transportation, or an education – and utter commitment to Her Majesty’s Service – at Madam Cairngrim’s school for female spies. The school’s regime is harsh. Eveline has already learned harder lessons. She plans to take advantage of everything they can teach her, then go her own way. But in the fury of the Opium Wars, the British Empire is about to make a devil’s bargain. Eveline’s choices will change the future of her world, and reveal the truth about the death of her sister Charlotte. 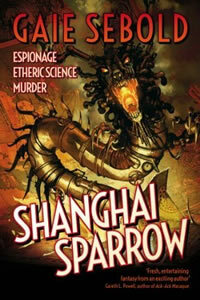 Shanghai Sparrow is set in an alternative England and China. It contains Formidable Devices, Fay, Etheric Science, Espionage, Opium, Murder and Bartitsu and may not be suitable for those of a delicate disposition.